Set amongst the trees of Sherwood Forest, Robin Hood is a five reel and three row slot game with 20 pre-set paylines and a theoretical return to player percentage of 96.8%. Boasting fun 3D graphics and a generous top jackpot, Robin Hood also includes a number of interesting extra features, including Shifting Reels with an up to x 5 multiplier, free spins and wild substitutions. Taking the legendary outlaw Robin Hood as its inspiration, the Robin Hood slot game provides a number of interesting features to players. We will take a look at these features below, as part of our review which will also cover the game’s top jackpot, special symbols, paytable and betting limits. As with many slots, the most valuable combinations which can be achieved across Robin Hood’s 20 paylines are those made up of five identical symbols. The most valuable such combination comprises five of the Robin Hood symbols and pays out at a rate of 1000 times the bet level. At the highest bet level of ten, therefore, that most valuable combination would provide a payline jackpot worth 10,000 coins. If the combination were to appear after the maximum x 5 Shifting Reels multiplier (more on this below) has been applied, however, the returns would be increased to 50,000 coins per payline. If the highest coin value of 50p is set that top jackpot per payline can be worth £25,000 to players. 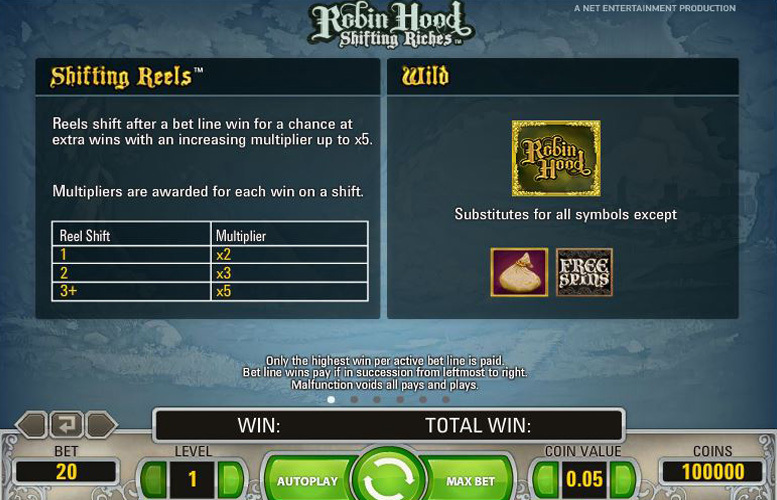 There are three special symbols involved in the gameplay of the Robin Hood slot in the shape of a Wild, a Money Bag and a Free Spin symbol, as well as a further additional feature called the Shifting Reels feature. Wild Symbol – the Wild symbol substitutes for all other symbols apart from the Money Bag and Free Spin symbols and can appear on reels 1, 2, 3 or 4 during the main game and 3, 4 or 5 during free spins. The wild will always go towards making up the most valuable possible combination for any payline and during free spins one of the character symbols becomes an extra wild. 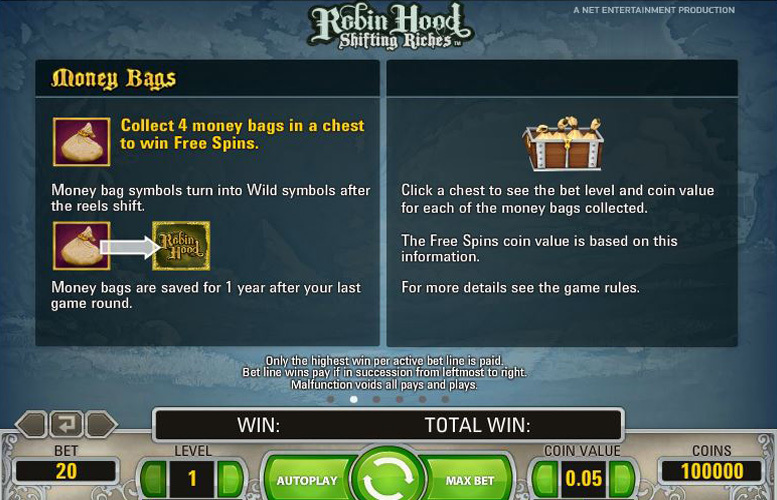 Both the Money Bag symbol and the Free Spin symbol are involved in the activation of free spins for the Robin Hood slot. Money Bag symbol – if a Money Bag symbol appears on any reel, a money bag drops into the chest beneath that reel, and if a chest becomes full of four bags then ten free spins are activated. Money bags last for one year and the bet level of any free spins earnt in this fashion is the same as it was for the spin which ultimately triggered them. Free Spin Symbol – coin value for free spins, meanwhile, is based upon the average size of bets placed when the bags were collected and is determined by a complicated equation which is given within the game’s help section. If a player sees two Free Spin symbols after a spin, five additional free spins are awarded and if three are shown, ten additional spins are triggered. 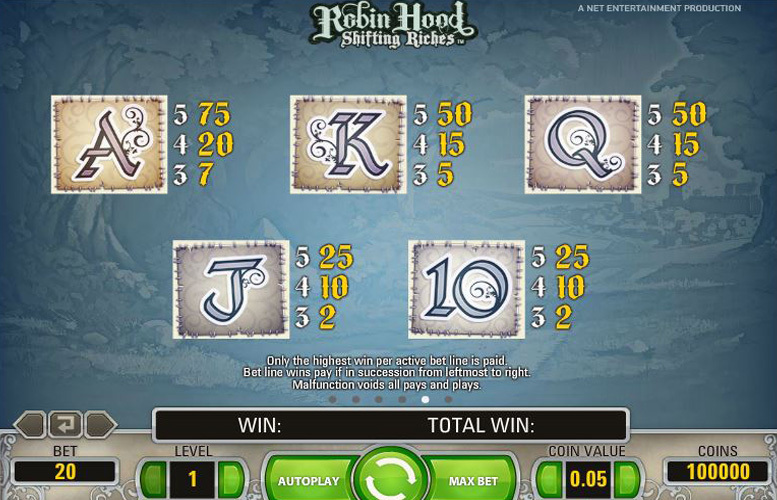 The Shifting Reels feature of the game is arguably the most notable element of the Robin Hood slot and can boost a player’s winnings significantly. The feature works by shifting the reels one to the right after every winning spin, to reveal an extra reel on the left which will spin independently in order to provide an extra chance to create winning combinations. Reels will keep shifting each time a winning combination is created and each time they do move, the game’s multiplier increases from x 1 up to a maximum of x 5. If the x 5 multiplier is reached, it remains active until no new winning combinations are created from a spin and Money Bag symbols are replaced by Wilds during Shifting Reels. The most valuable symbols in the Robin Hood game are those which depict characters from the legend and the most valuable of all is of course Robin Hood himself. A combination of five of his symbols is worth 1000 times the bet level, which can equate to a payout of 10,000 coins at the maximum bet level of ten. If the combinations were to appear when the x 5 Shifting Reels multiplier is active, that payout would of course be multiplied accordingly to equal an impressive jackpot of 50,000 coins per payline. The second most valuable symbol, meanwhile, is the Maid Marian symbol which pays out at an equally impressive rate of 750 times the bet level for a five symbol combination. At bet level ten and with the x 5 Shifting Reels multiplier active, then, that combination results in a jackpot of 37,500 coins per payline. 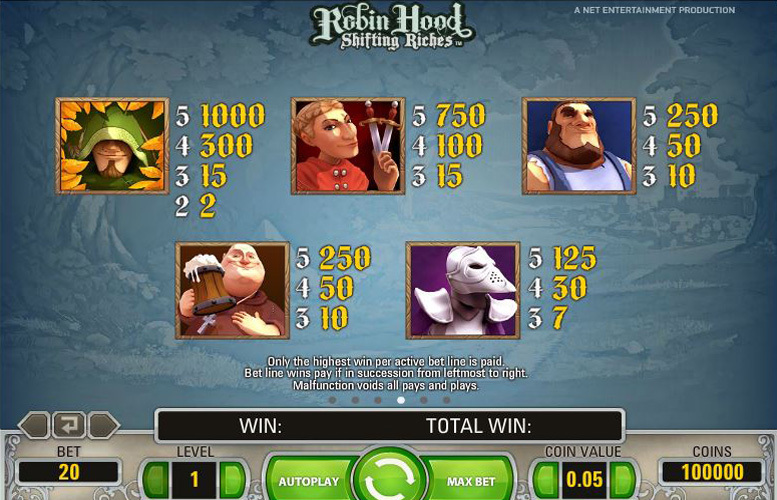 Players can tailor their betting amount within the Robin Hood slot by setting both their bet level and coin value per spin. There are ten possible bet levels from 1-10, each of which adds an extra coin per line, and six different coin values from 1p up to 50p. Setting a bet level of one and coin value of 1p, therefore, results in the minimum possible stake of 20p (1p per line). If bet level ten and a coin value of 50p is chosen, meanwhile, the maximum possible stake of £100 (£5 per line) can be wagered. 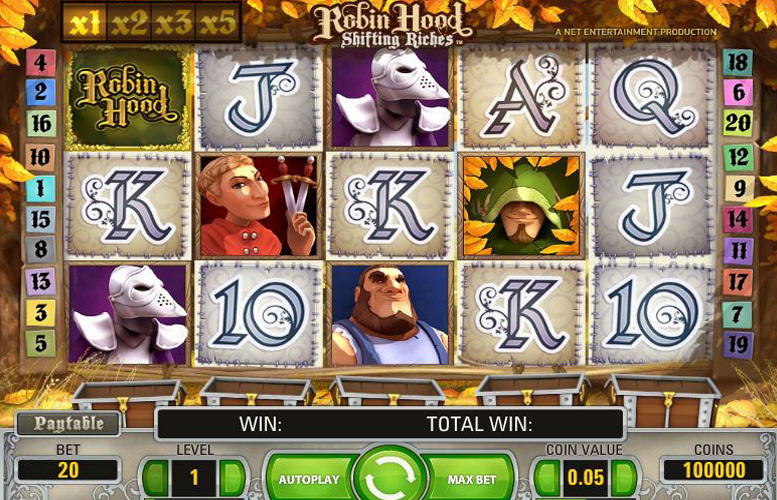 Robin Hood is a game which manages to combine a fun and interesting theme, attractive symbols and graphics, unique and exciting gameplay, and sizeable jackpots to provide players with a really impressive overall slot. The choice of legendary outlaw Robin Hood as the inspiration for the game allows it to introduce both attractive symbols and to create really interesting gameplay features. Those features include an often really beneficial Shifting Reels feature and Money Bag activated free spins, both of which also boast fun graphics to add to a player’s enjoyment. Arguably most important of all, however, is the fact that the Shifting Reels feature also helps to offer players the chance to win really impressive overall jackpot amounts due to the up to x 5 multiplier which is linked to it. This game has a rating of 5 / 5 with 812 total reviews by the users.